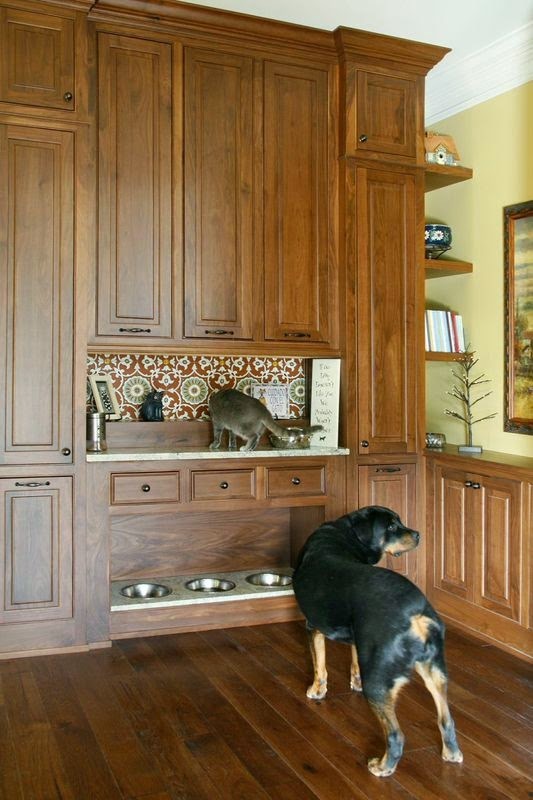 Designing cabinetry for humans is cool and all, but designing cabinetry for animals.... THAT is just down right satisfying and rewarding. Last summer/fall fellow Bell Kitchen & Bath Studios designer Keri Perry and I were in the thick of working on designs for a huge remodeling project, when we found ourselves with some unique clientele to consider...two dogs and a cat. This remodel was big and much of the first floor of the home was re-designed. As we worked through designing the various areas of the home, we had one very clear goal in mind. Make it beautiful, but make it explode with functionality. As we dug into the details and began determining where various items would be housed we quickly realized there were certain 4-legged family members who had a fair amount of gear themselves and that gear needed to be organized just like everything else. Now I don't know how many pets you know, but pets, no matter how big or small, have stuff...lots of it. When we first met this project the cat's food dish and water dispenser were sitting on the countertop in the kitchen, so as to keep it out of the dogs' reach. The dog bowls were sitting by the end of the island and the cat's litter box was housed behind a cabinet door in the laundry room with a small hole for access. It was functional, but far from pretty. The whiskers! The tail! Can you even deal with the cuteness? 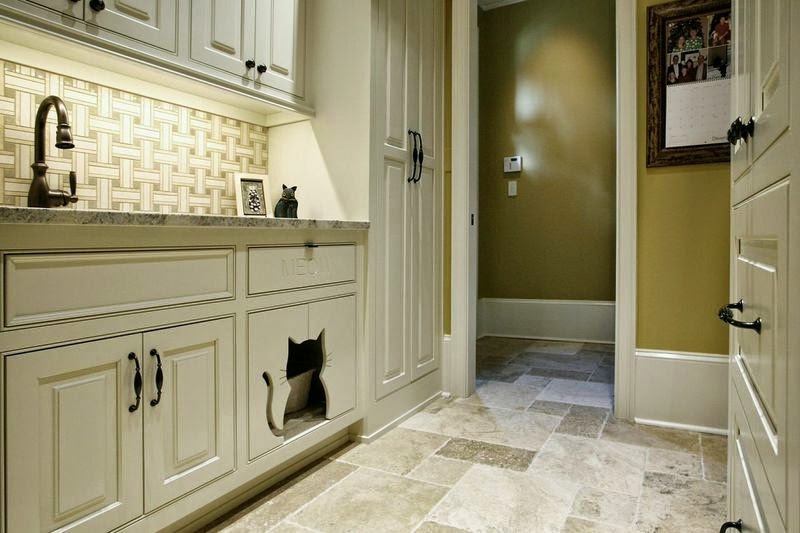 Now, not only does the cat have a chic' home for his litter box, but the entire set-up is easily accessible for both cat and human. Even better, now the LITTER BOX cabinet is the "cool kid in school" in this Laundry Room. As for the animal food and gear, we designed an entire area right outside the kitchen that we called THE PET STATION. The pet station includes 3 dog bowls, 2 for food and 1 for water. These bowls were custom built to fit snugly in the base of the center cabinet with granite installed atop to ensure any splishing or splashing while drinking wouldn't harm the wood. As for the cat, another bowl was designed to sit on it's own ledge, high above the dogs, so the animals could eat together without bothering each other. A pullout was installed on each side of the dog bowls to house dry food. The small drawers above the dog bowls were designed to hold leashes, collars and other small necessities. As for the rest of the space, behind each wall cabinet is a series of adjustable shelves so anything from wet food to treats and toys can easily be stored and organized, but out of sight. All cabinetry is from Bell Kitchen & Bath Studios Signature Collection. 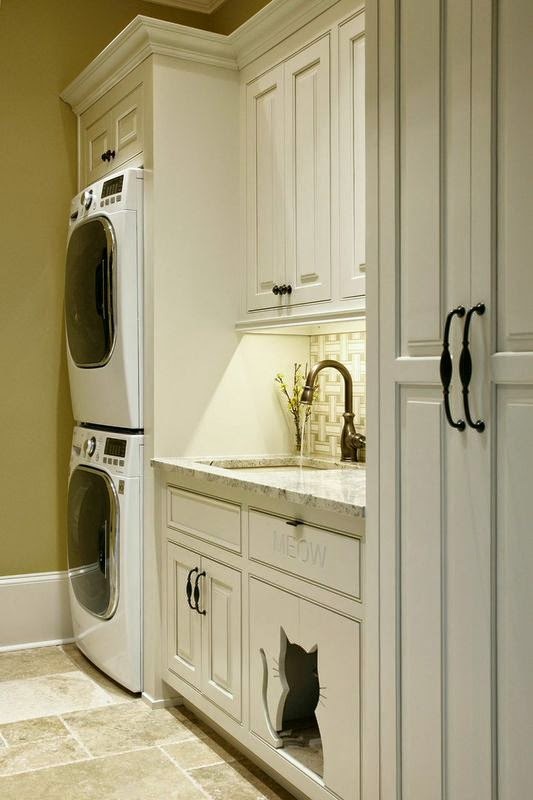 The pet station is walnut and the laundry room is maple with a painted finish.